This San Jose band formed in the summer of 1965 at Foothills college in Los Altos and were discovered late the following year by Ed Cobb. Their original line-up included Pete Curry on drums, who went on to become guitarist / songwriter with The Halibuts. His time in the band was severely limited however, and after their first gig was replaced by Gary Andrijasevich. Although nothing was released by the first couple of line-ups (*), they were reputedly on par with the "classic" The Chocolate Watchband, with Dan Phay being a particularly charismatic front-man. The band were also friends with another act called The Topsiders who for a short while included Skip Spence, prior to his joining Jefferson Airplane. In 1965, both bands underwent a number of changes, with Phay, Torney and Kemling all leaving to join The Topsiders (who then became The Other Side), whilst Sean Tolby, moved from The Topsiders to The Chocolate Watchband. Indeed Mark Loomis (ex-Shandels) also had a brief spell with The Other Side after Rich Young was drafted, before he decided to reform the 'Watchband with Gary Andrijasevich and Jo Kemling. The latter opted to stay with The Other Side however, and bassist, Bill Flores (ex-Shandels) and, a vocalist, biology student Dave Aguilar, were drafted in to complete The Chocolate Watch Band's new line-up. Heavily influenced by British R & B outfits like The Stones and The Yardbirds, the band gigged regularly around the Bay Area supporting bands like The Doors, Big Brother and The Holding Co. and The Mothers of Invention. They were signed to Tower and recorded a debut single in 1966. The 'A' side, written by Cobb, was a fine Stones' infIuenced number, but with an uniquely Californian interpretation. Inexplicably, Tower issued the single on its black R & B subsidiary label, Uptown, which did not, as a white group on this label, attract the airplay it deserved. 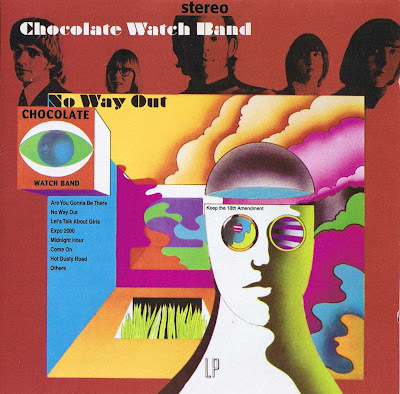 On Cobbs insistence, The Chocolate Watch Band returned to the studio to record a cover version of Blue Theme, originally performed by Dave Allen and the Arrows, on the soundtrack to The Wild Angels. However, Tower were not convinced of its commerciality, and Cobb leased the finished master to Hanna Barbers records. It was released, under the pseudonym, The Hogs, as HBR 511, with Loose Lip Sync Ship, which culminates into a strange psychedelic piece of dementia, on the flip side. It was quite successful locally and Dave Allen's version of Blue Theme became a Top 40 hit. The 'A' side of their next single Misty Lane was more commercial and not as powerful as Sweet Young Thing. The flip was an uncharacteristically reflective, quieter number with a stringed and woodwind section. 1967 saw the band record two tracks Don't Need Your Lovin' and Sitting Here Standing, on the soundtrack to Riot On Sunset Strip. September 1967 saw the release of their debut album No Way Out. Essentially a collection of psychedelic punk, containing the impressive Let's Talk About Girls (featured on the Nuggets compilation), punk versions of Come On and In The Midnight Hour as well as drug-influenced songs like Expo 2000, The Dark Side Of The Mushroom, Gosamer Wings and the title track. Many of the songs have an Eastern influence. It has later been revealed that the band did not play on the spacier tracks on this album, for which Cobb used session musicians. It is now known, too, that arranger Don Bennett and not Dave Aguilar sang the vocals on Let's Talk About Girls. However, the full band did play on Are You Gonna Be There (At The Love In)/No Way Out their next single lifted from the album. Aguilar's explanation for the mixed-up nature of the studio recordings is that the band considered themselves primarily live performers who "loved to challenge big-namegroups and blow 'em off the stage. That's where we got our excitement and our kicks". The studio stuff was considered a mere sidelight which they left mainly in Cobb's hands. The Eastern influence is developed further on their excellent second album, The Inner Mystique, which appeared in February 1968 and actually comprised of outtakes from the first album plus new recordings that didn't feature the band. Aguilar, Loomis and Andrijasevich had all quit before the release of the first album leaving Flores and Tolby to fill their spaces with other musicians from the San Francisco Bay Blues Band. The band did not appear at all on the 'A' side, which was the work of Ed Cobb's session musicians. There was a mystical/Eastern element to instrumentals Voyage Of The Trieste and Inner Mystique, (both written by Cobb) and in their cover version of We The People's In The Past. The band itself did play on side two, which included a remix of Dylan's Baby Blue taken from their first single, an excellent version of Ray Davies' I'm Not Like Everybody Else and The Brogues' I Ain't No Miracle Worker. Flore and Tolby also quit in late '67, prior to the albums release, although this was because of the problems in maintaining a stable line-up rather than any frustration with Cobb's influence over the bands recordings. With no band to promote the release, a year passed before Ed Cobb persuaded some members to reform the band and have another go. Guitarist Danny Phay (from The Other Side) came back in as a replacement for Dave Aguilar, who decided not to get involved again. The band wrote all the material for the resultant One Step Beyond album, but aside from I Don't Need No Doctor, it's comparatively disappointing. They split again after this album was released in 1969 and an attempted reformation in 1970 lasted just one month. Dave Aguilar was reported, in 1983, to be Professor of Astronomy at Colorado University and he then moved into doing research for the aerospace industry. Rich Young now gigs in the bay area with Jerry Miller of Moby Grape fame. Sean Tolby is now dead. Later revelations that the band did not play on some of their album tracks perhaps diminish a little of their reputation, but they remain one of the most interesting West Coast bands and they made some fine music. In 1999, the band reformed for a gig at the 3-day "66-99" event in San Diego on 12th June and later at the New York 'Cavestomp '99!' on Nov 5-7th alongside The Standells, Monks et al.